Neem (Azadirachta indica) is a fast growing, flowering tree, native to north-east India. 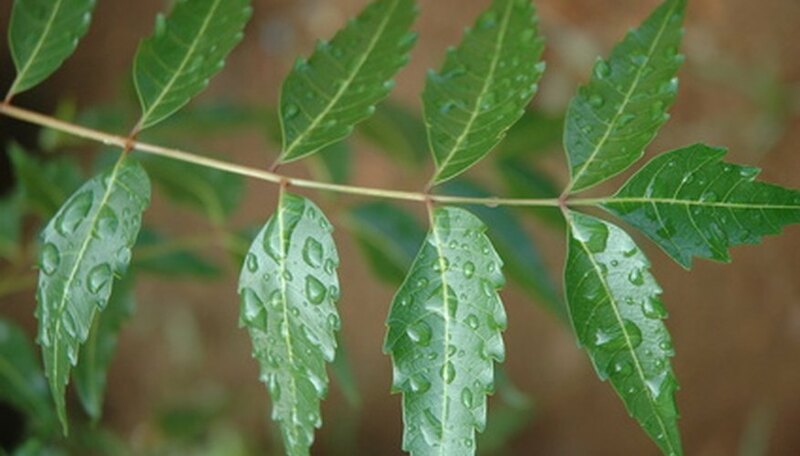 Due to its rapid growth and ability to withstand a variety of harsh conditions, including high temperatures and poor soil, neem is becoming an important crop in many tropical and arid areas of the world. It is a tree of many uses; the leaves, bark, and berries are used in internal and external preparations for a wide variety of ailments, the oil from the leaves is used as a natural insecticide for crops and gardens, and the trees themselves counter erosion problems and provide shade for people and livestock. Neem trees grow in tropical and subtropical regions with climate ranges from humid to sub-arid. Neem is not a cold hardy plant and will shed leaves and die at temperatures below 39 degrees Fahrenheit. The ideal temperature range for cultivating neem trees is between 50 and 98 degrees Fahrenheit, however it can withstand temperatures of up to 120 degrees Fahrenheit for a limited period of time. Neem grows between sea level and 2300 feet above sea level. The neem tree is tolerant of both dry, semi arid conditions, and periods of drought, as well as periods of high humidity and heavy rain fall. Neem trees experience optimum growth in areas that get 45 inches of rain a year on average; however, an average annual rain fall between 20 and 50 inches is suitable for cultivating neem. Established trees can survive in climates with as little as 6 inches of rain a year if the roots are deep enough to access ground water tables. Neem grows well in loose, well-draining, and sandy soil. Neem is notably tolerant of nutritionally poor and rocky soil. It does not tolerate wet, water logged soil and standing water around the roots. The ideal pH balance is between 6.2 and 7.0, however, it will tolerate a pH range between 5 and 8, according to Australia's Queensland Government. In heavy, clay like soil, plant neem on a rise or slope to provide adequate drainage. Neem seeds germinate reliably and quickly making this the preferred method for propagation. Harvest the neem fruits from the tree when they turn from green to pale yellow. Plant the seeds within eight days of harvest to insure viability. Neem seeds do well planted directly into the field. Make a small 1-inch hole and drop the seed in, then push the soil back over the seed. Germination takes place in one to three weeks. Other methods of propagation include rooting suckers and stem cuttings. Neem tree heights average 50 to 65 feet tall but some individual trees can grow as tall as 130 feet tall with a canopy spread of 50 to 60 feet wide. After the first three to five years, neem trees begin producing harvestable berries. The trees begin producing fully after ten years and can live for 150 to 200 years. A mature neem tree produces 50 to 110 lbs of harvestable fruit each year.